I knew I couldn't take them all back, so I drank the Double Simcoe IPA that evening when I returned from the store. I definitely needed a beer after our first day of wandering around DC. Well balanced between sweet caramel malts and a piney hop bitterness. The Saison de Lente is a spring seasonal from The Bruery and was the perfect beer to drink on Easter Sunday. Crisp and refreshing with a light citrus and coriander flavour. A little lighter then a typical saison, but perfect after another long day of sightseeing. 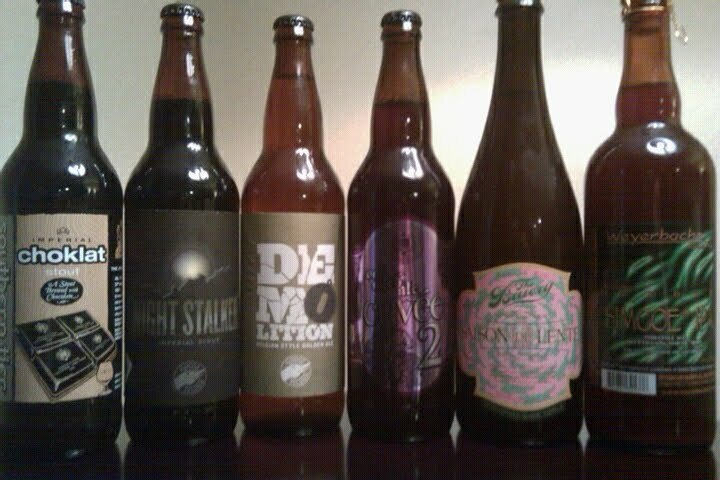 The remaining four beers I manged to cram into my suitcase and they all arrived safe and sound. I'll probably age the two beers from Goose Island for awhile, but drink the two from Southern Tier relatively soon. Great selection! I loved the Choklat that I got to sample at Camp Beer, although it was such a small sample I wanted more! Interested in your thoughts on the Bruery beer. I haven't had many from them, but I've been impressed so far. If comparing the Saison de Lente to other saisons, then I'd say it has a lighter flavour. It has the typical citrus and farmhouse funk to it, just not as heavy. It also drinks particularly light considering its 6.5%. I grabbed the Choklat because of that sample we had of it from Camp Beer as well. First, great take home. Did you make it out to the Brickskeller? I was in DC for SAVOR last year and didn't make it out... could kick myself. "...large Whole Foods only two blogs from our hotel"
That's cool, b/c three blogs is way too far to walk. Just messing... thanks for the good read... now I'm thirsty at 9AM! Thanks, corrected. Amazing how many times you can read something but not notice a mistake. I didn't make it to the Brickskeller, but we did go to Regional Food and Drink (RFD) which appears to have the same owners. The Brickskeller actually had lots of bad reviews online but RFD was great. I'll get a post up about it this weekend. Just finishing my post about the Churchkey. Also need to write one for Brasserie Beck.